Butterflies will use gardens planted to attract them, according to a new study from the University of Georgia. But the researchers cautioned that butterfly gardens can sometimes have a downside by exposing caterpillars to increased threats from predators or disease. They published their findings recently in the journal Insect Conservation and Diversity. Insect pollinators are in decline globally due in large part to loss of habitat, and many concerned individuals have responded by planting butterfly gardens in hopes of boosting their numbers. Such gardens can vary widely, ranging from naturalistic plots of native vegetation to manicured beds filled with exotic plants. Ania Majewska, a doctoral student at the UGA Odum School of Ecology, wanted to find out whether these gardens were having the desired effect of promoting butterfly conservation. She was particularly interested in whether the choice of plants and the intensity of garden maintenance made a difference. "Planting gardens for pollinators is increasingly popular, but scientists still know little about how these human-created habitats affect pollinator populations," she said. Majewska found the ideal study site at the interdisciplinary UGA Center for Research and Education at Wormsloe near Savannah. Located within the 334-acre Wormsloe State Historic Site, one of the few undeveloped greenspaces in the area, it encompasses a variety of coastal habitats. "Because of its unique landscape and rich species diversity, Wormsloe is an excellent place to conduct ecological research," Majewska said. 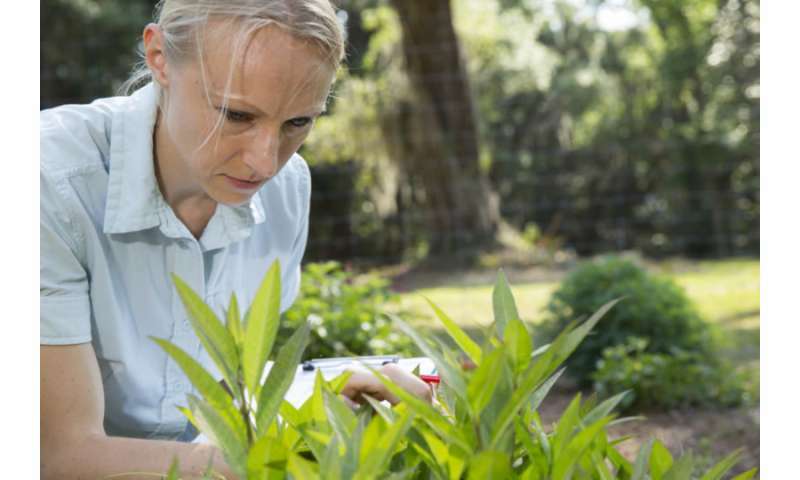 Together with co-authors Andy Davis and Sonia Altizer of the Odum School faculty, she developed a series of experimental plots, laid out in three blocks of four, designed to attract four butterfly species commonly found in the southeastern U.S.: the monarch, queen, gulf fritillary and black swallowtail. Each block contained two plots with only native plants and two with only exotic plants, including food plants for caterpillars specific to each of the target species. Plots also differed in the intensity of maintenance (regular versus minimal weeding). Over the course of the growing season, Majewska surveyed all butterflies that used the garden plots, and counted eggs and caterpillars of the four target species. "Within two months of planting the experimental gardens, they were colonized by a high diversity of butterflies," Majewska said. 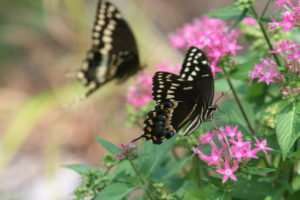 Twenty-two species were documented in the gardens, and the four target species reproduced within the garden plots, leading to an increase in butterfly abundance over time. Majewska and her colleagues expected that butterflies would prefer the native plots, and that caterpillars would survive better in the low-maintenance plots. That was not, however, what they found. "We were surprised that the two main garden characteristics we focused on, the choice of native versus exotic plants and weeding intensity, did not have stronger effects on the use of gardens by butterflies," Majewska said. Instead, the number of plants actively flowering had the greatest influence on butterfly abundance and diversity. Two species—monarchs and gulf fritillaries—were somewhat more abundant in the exotic plots, possibly because their exotic host plants are showier and bloom longer than their native counterparts. Gulf fritillaries were also more abundant in the more heavily weeded plots, suggesting that weedy gardens might offer more hiding places for their predators. Majewska and her colleagues also tested monarch caterpillar survival within versus outside of the garden plots. They discovered that caterpillars survived better outside the gardens than within them, indicating that gardens might attract butterfly predators as well as the butterflies themselves. Majewska said the findings were encouraging, but further study is needed to understand the optimal characteristics of pollinator gardens and how gardens perform compared to wild habitats. "Even though it's clear that monarchs were attracted to exotic milkweed plants in the gardens, we are not convinced that is a good thing," Majewska said. "Exotic milkweed plants used in this study differ in many ways from native milkweeds, and earlier studies show that they can cause high levels of disease in monarch populations. We need more information on the rates and causes of butterfly mortality in gardens to better design habitats that are beneficial and will support pollinators."